Egham, 3rd May 2018 – OKI Europe Ltd will be exhibiting its award winning Large Format printers at FESPA 2018, stand 3.1 – A22. The leading supplier of printers and printing solutions for ‘print for profit’ businesses will be showcasing an innovative and exciting range of diverse indoor and outdoor applications at the event taking place in Berlin, 15-18th May. OKI’s Large Format ColorPainter range offers superior quality, colour density and additional revenue streams for businesses in the ‘print for profit’ sector. Visitors to the show can experience for themselves the ColorPainter M-64s which was recently awarded the Outstanding “Enhanced” CMYK Eco-solvent/Latex 54″/64″ Printer Pick Award 2018 by Keypoint Intelligence’s Buyers Lab (BLI). 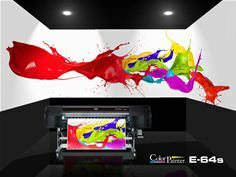 The ColorPainter E-64s, similarly an award winner, will also be available on the OKI stand. This recent addition to the portfolio offers sign makers, exhibition services providers, screen printers and others the potential to progress from low-margin vinyl and banner printing into more profitable applications, enabling businesses to continuously evolve and build upon their success. “We are very excited to once again attend FESPA as a Gold Partner. At this year’s event we will present our innovative technologies on the unmissable OKI Europe stand which will be ALIVE WITH COLOUR. Alongside our celebrated Large Format ColorPainter portfolio, we will be showcasing a wide range of print technologies that help businesses across the sector increase their creative output and grow their revenues,” says Pamela Ghosal, General Manager, Marketing Communications, OKI Europe Ltd.